About 90% of the American population has had their wisdom teeth removed. But why is it important that we get these teeth extracted? Is wisdom teeth surgery really that important? What happens if we don’t have our wisdom teeth taken out? The team at our dental office in St. Petersburg has the answers. Wisdom teeth tend to develop in our teens. This is when your dentist in St. Petersburg should start to see these third molars on x-rays and when your dental team will start to monitor their development. Occasionally, wisdom teeth develop just fine and there are no reasons for concern. Other times people don’t get their wisdom teeth at all. But more commonly, wisdom teeth need to be removed for a few specific reasons. Let’s take a look at the top reasons why wisdom teeth extraction is usually recommended. Most people fall into the category where their mouths don’t have enough space to accommodate four more teeth. This can often be identified early through dental x-rays, and wisdom teeth removal can be incredibly easy. However, if treatment is delayed or avoided, the teeth can get trapped in the bone and become impacted. Impacted wisdom teeth can be very painful and put you at increased risk for infection or an abscess. Furthermore, if wisdom teeth aren’t removed and are allowed to force their way into the mouth, other teeth will shift to make room. This will result in overlapping, crooked teeth. Normally wisdom teeth will be facing crown up like all your other teeth. But sometimes wisdom teeth can come in at a weird angle or even sideways. When this happens the wisdom teeth should definitely be extracted. If not, these large teeth can cause permanent damage and severely affect the other teeth in the mouth. There are times when wisdom teeth come in almost perfectly and there’s no immediate need for extraction. However, wisdom teeth are difficult to care for properly. They’re hard to reach with a toothbrush and flossing requires an almost acrobatic approach. Because of this, your dentist may still recommend having them removed if only to reduce the risk of other problems down the road. 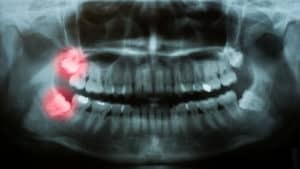 Wisdom teeth removal is incredibly common and most people have theirs removed at some point in their lives. The best way to monitor wisdom teeth development is to maintain regular appointments at our St. Petersburg dental office. Keeping a close eye on how your wisdom teeth are erupting can mean a quicker treatment plan and easier removal.